When one thinks Roland Sands Design, the first things that come to mind are v-twins, cafe racers, leather, and style. Roland’s brand has historically focused primarily on the cruiser and cafe segment and has done so with great success; their products ooze style. Which is why we are so excited to see some of the new adventure focused offerings coming out of the Roland camp. Adventure bikes and adventure riding is in and here to stay. Enter the all new Roland Sands Sentinel Jacket. The Roland Sands Sentinel Jacket is packed with tons of adventure features in a stealthy package. The protection package includes real Cordura, SAS-TEC shoulder and elbow armor, a rear pocket ready to accept a back protector, as well as ample yet understated reflectivity for night riding. The jacket seals out the weather by the way of a Teflon DWR coating and a permanently affixed waterproof Z-liner. The jacket comes equipped with a removable 3-layer weather-resistant liner for insulation. This liner is finished and can be worn as your destination layer. 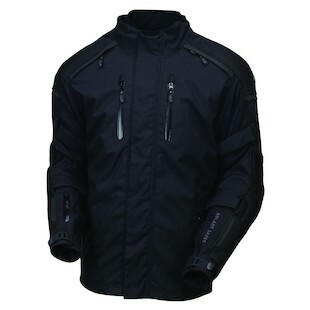 The Sentinel is set up with 6 vents on the arms, chest, and back, although due to the Z-liner these vents do not flow air directly to the body, so this jacket will be best for temperate to colder weather riding. Adding to the list of adventure friendly features are a fanny pack out back, 6 external pockets, and 7 internal pockets, giving the jacket an impressive amount of storage. Currently the Sentinel is offered only in an Anthracite colorway, which should hide dirt and road grime quite well. Here at RevZilla we are very excited to see how Roland's foray into adventure riding gear turns out. We have been impressed time and time again with his leather, textile, and hard-part accessories, we expect this jacket to impress and function well. So if you are in the market for a new adventure jacket that stands out from the usual suspects, the all new Roland Sands Sentinel should be high up on your list.